Shredding Classical - Caprice No.5. By Andy James. By Andy James, Niccolo Paganini. Lick Library. Technique, Instruction. DVD Only. Lick Library #MUSRDR0174. Published by Lick Library (HL.393077). 5.5x7.5 inches. English(UK). Andy James. 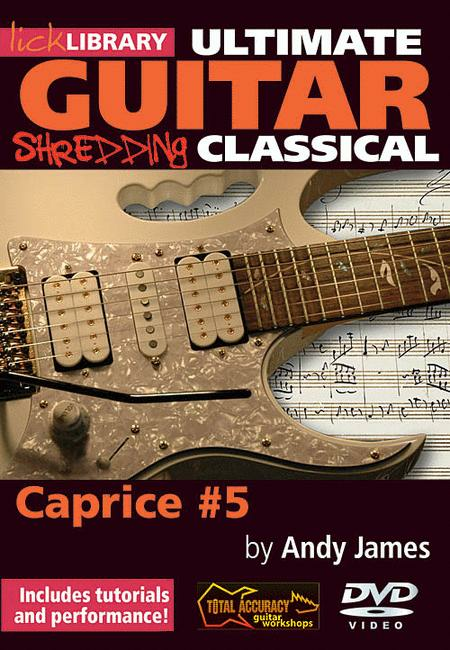 Learn To Play Paganini's Caprice Number 5 on electric guitar with Andy James - a rewarding challenge for any guitarist. The 24 Caprices have often been hailed as some of the most challenging musical pieces ever written. We have taken this music and translated it to the electric guitar to provide a wealth of melody, harmony and killer guitar licks! Although not for the faint-hearted, completing these pieces will not only make you a better player, but will also put you out there with some of the best technicians in the world. 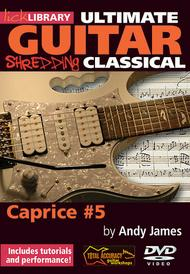 Learn To Play Paganini's Caprice Number 5 on electric guitar with Andy James - a rewarding challenge for any guitarist. Although not for the faint-hearted, completing these pieces will not only make you a better player, but will also put you out there with some of the best technicians in the world.